The Benefits of Locally-Grown Food | Kid Reporters' Notebook | Scholastic Inc.
GoFarm Hawaii`i at Maui takes place at UH Maui College. Do you ever wonder about what the term “locally-grown food” means? Do you wonder where your food comes from? Locally-grown food and sustainability are on the rise, and it’s important to know why this trend in farming matters. Hawaii, in particular, is a pretty isolated place. We import about 85 percent of our food. Much of what gets to our table depends on what comes to use by ship. Sometimes, one will notice there is no milk or other product left at the grocery story because there was a problem with a barge. I recently spoke by phone with Steven Chiang, the Director of the Agribusiness Incubator Program at the University of Hawaii in Honolulu. He pointed out that in Hawaii, the cost of labor is high for people who might want to farm the land. Since many different groups or individuals own small pieces of land, getting access to farmland is also difficult. However, Chiang added, there are many benefits to growing food locally on our islands and elsewhere. For one, we can hold onto traditions and the types of food we like. Food in our soil will have the chance to mature more, and maybe absorb more nutrition. Areas of land that might be used for other things, like new apartment or office buildings, can be preserved. Also, plants can extract the carbon dioxide in the air, benefiting our environment. Chiang said that there was more to locally-grown food then just those benefits. “Having local food helps make people aware of where their food comes from," he said. "When people are disconnected from the food system and don’t know where their food comes from, there’s a tendency to make potentially negative choices." So what can you do? 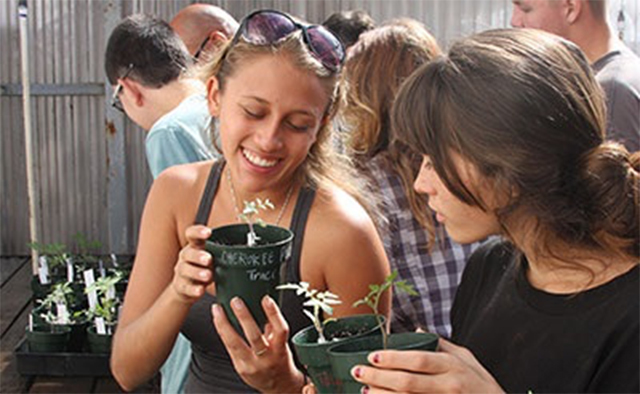 In Hawaii, there are many opportunities to volunteer at local farms. But in other states or other countries around the world, you can do your part by supporting and buying locally-grown food. You can also help spread awareness by educating your friends and family. You can even grow your own food—in a container in your kitchen or in your backyard!